Fiducial marker beads, during a Magnetic Tweezer measurement, tracked using ClickPoints. 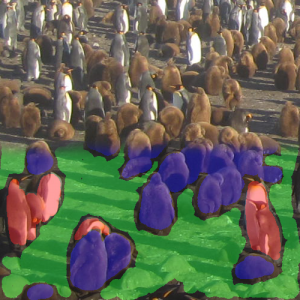 Masks for penguin classification drawn in ClickPoints. 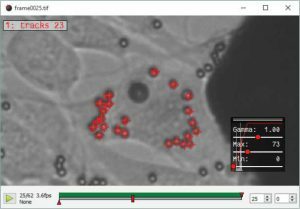 ClickPoints is a versatile software that allows view collections of images and analyze them for scientific evaluations. ClickPoints combines and streamlines the three main steps of image analysis – visualization, annotation and evaluation – in one program. custom-written Python add-ons for adapting or extending the available features. reduce development time by utilizing ClickPoints’ display, interface and storage solutions. extensive data base application programming interface to facilitate efficient storage and retrieval of results. released under the GPLv3 license. Download, documentation and numerous examples are available at http://clickpoints.readthedocs.io. Richard Gerum, Sebastian Richter, Ben Fabry and Daniel Zitterbart.